Not always we are in a mood to cook; at times we might be short of time, other times we might be short of energy. For such situations, here is a healthy and quick meal idea. Idli served with sambar and coconut chutney!! Okay, this might look a bit elaborate but believe me it can be fixed in 30 minutes or so. We don’t need any special ingredients for this, not even fresh coconut for the coconut chutney. 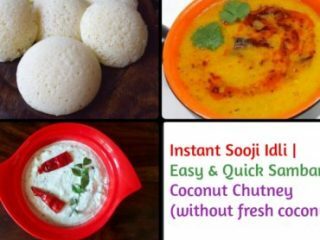 Instant sooji idli can be prepared in 15-20 minutes, sambar can be done effortlessly as it is a fuss-free sambar recipe and the coconut chutney doesn’t call for breaking or chopping coconut as it doesn’t call for any fresh coconut. 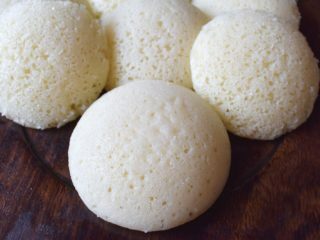 Soak semolina (sooji/rava) for idli and while it rests start preparing your sambar. While the sambar gets pressure cooked, do your chutney and put idlis for steaming. By the time idlis get steamed, temper the sambar. The chutney is done, sambar has been tempered and idlis have steamed. Demould them and tadaa, your dinner is ready. Now just dunk in soft idlis in hot sambar, top with coconut chutney and indulge!